Furniture shopping has long enjoyed a reputation as romantically ruinous. Whether you’re visiting a certain flat-pack big box store, or picking delicately through a curated chair boutique, you’re probably having a fight. Turns out, that reputation is well earned and supported by statistics. You may have noticed that here at Article, we’re obsessed with beautiful, quality furniture. We’re also obsessed with making that furniture really easy to get. Maybe even… fun. And arguing with your housemates — romantic, platonic, animal — is not easy. Or fun. To dive into this, we decided to partner with the smart people over at OnePoll to get a sense of what was really annoying about shopping for furniture, and what was really great about it. We also wanted to understand how people pick furniture for their house and make those items into pieces for their home. To start, we looked at how furniture has always been shopped for. Without fail, it started with clearing a precious day off to visit the shop. Average time spent in a store was high, but we expected that. What we didn’t expect was the sheer amount of emotional casualty wreaked by a shopping trip. In one year the average couple will have around 72 disagreements about decor style, purchasing decisions and furniture purchases. For science, we broke that number down even further. Eight of those arguments will occur at the store. PDA takes on a new meaning. 15 arguments happen inside of the home in question. Not chill. 10 fights will happen in front of a friend or family member. It’s called leverage. Four fights will happen… on an airplane. The 35 leftover fights were pretty spread out, but they were most likely to occur in a movie theatre, library, or… amusement park. In conclusion: people fight in weird places, and furniture is a hot topic. 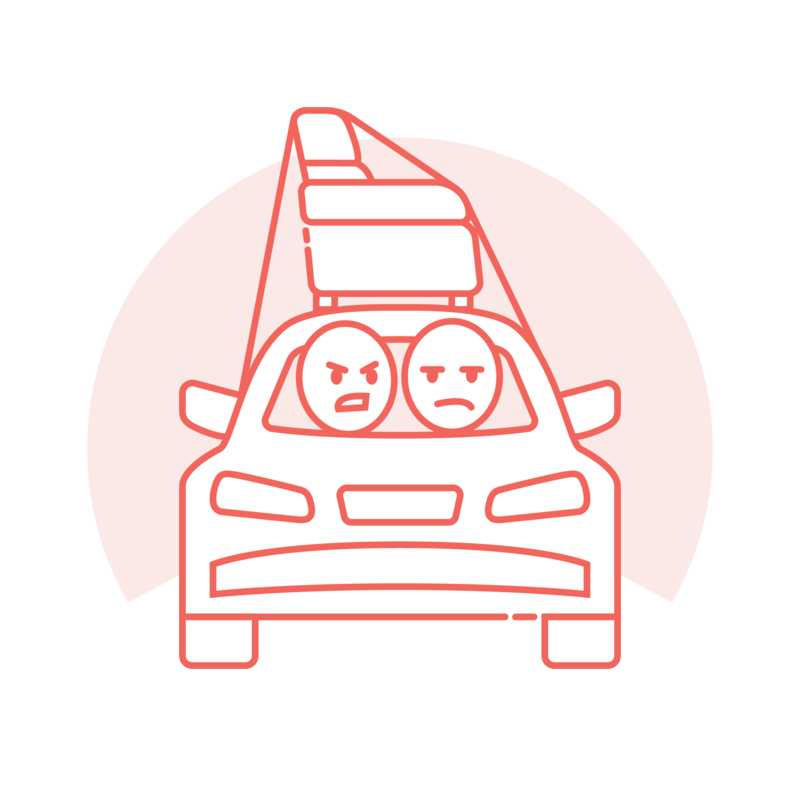 Perhaps unsurprisingly, as much as 15% of Americans avoid going to the furniture store with their partner because the visit always leaves them feeling grumpy with each other. 21% described shopping with their partner as “annoying,” while a democratic 58% simply don’t offer their opinion, staving off fights altogether. We prodded the bruise a bit to find out what exactly these fights were about. We found that budget, furniture styles, and color selection were the leading frustrations. Other tiffs revolve around deciding on what gadgets to purchase (21 percent), the style of furniture (21 percent), and the overall color scheme (20 percent). While we weren’t really surprised by the frustration that furniture shopping inspires, we are saddened by it. We built Article to make furniture shopping easier. If we can make it happier too, that’s a pretty great bonus. So to make furniture shopping both easier and happier, we knew that we had to better understand what furniture items make a person feel happiest in their home. We set to work devising a brand new set of questions. What furniture items help take a place from “house” to “home”? We began by asking after specific rooms. When you’re moving into a new space, what is your decorating priority? 42% of Americans responded that they’ll always furnish the bedroom first. That tracks for us, as 76% of respondents attested to the bed being the item that made them feel most at home. 25% put their energy into furnishing the living room first. With 71% ranking a cozy sofa as their #1 most coveted item, we were surprised to see the living room come second… but then we remembered how great bed is. The kitchen came in third, with only 13% of respondents considering it their homey-priority. Interestingly, the dining table garnered a whopping 60% of votes, and kitchen utensils 54%. It’s not a house-cooked meal, it’s a home-cooked one. Nice. We can wrap this into a pretty tidy equation. Other factors, such as style of home and preferred colors, certainly add to the feeling of homeyness, but serve more to direct the choices of furniture and decor for the above-mentioned rooms. 31% of people like their furniture to be a strong, stately black. 28% want something a little softer: a pretty gray. 27% lean into clean, crisp whites. 22% like a friendly blue. And stunningly, 21% have no preference. At all?! And finally, 21.5% said they didn’t know what they’d call their home-style. Digging into those numbers, nearly half of respondents say that their house isn’t officially a home until they have family visit. 41% consider the hallmark of home to be hanging pictures on the wall. One in five agreed that once they’re on a first-name basis with their neighbours, they are home. So our survey findings were interesting, but imperfect. Sort of like the process of making a house feel like home. When everyone’s clinking glasses and ready to tuck into dinner, your furniture selection won’t be the most important element of your space. It will simply be another thoughtful element of your home. Your home is a sum of its parts — the effort put into making the space reflect your family doesn’t go unnoticed. It envelopes your people and offers a sense of place that is deeply connected to your values. So, cheers.